Thomas Marriott, Clerk to the Guardians of the Southwell Union, to the Poor Law Commission, lists women by name, with their children and their ages, compares cost of outdoor relief with cost of keeping them in the workhouse. He asks whether deserted wives/widows and their children can continue to receive outdoor relief [payment] or whether they should be sent to the workhouse. If they are sent to the workhouse the building will soon be too small and the expenditure will double. of the cost of each person out of the House [workhouse], and what they will cost in. 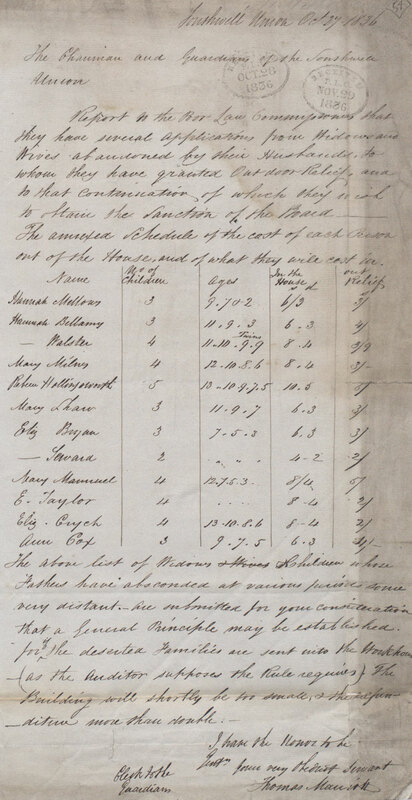 The above list of Widows & children whose Fathers have absconded [run away] at various periods, some very distant are submitted [sent in] for your consideration [opinion] that a general principal [rule] may be established [set down] for if the deserted families are sent into the Workhouse- (as the auditor [person who checks how much the Workhouse is spending] supposes the rule requires). The building will shortly be too small, and the expenditure [cost] more than double.